The time? Just a few days ago. The occasion? Stir-Up Sunday, the date on which households around the world, for eons upon eons, have prepared their holiday plum pudding. 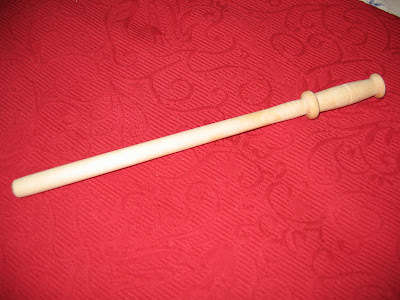 What do you mean, you forgot to celebrate Stir-Up Sunday? Until just one year ago, I too, was a plum pudding novice. That was until Jill from Ottawa and I initiated our cross-continental celebration of Stir Up Sunday and the traditional lighting of the Christmas Pudding. Stir-Up Sunday is known in England as the Sunday before the first day of Advent, but it is also the day to prepare Christmas Pudding, a steamed dessert of dried fruit, spices, and butter or suet. Family members each get a chance to stir ingredients into the batter and tradition allows them to make a wish with each stir. 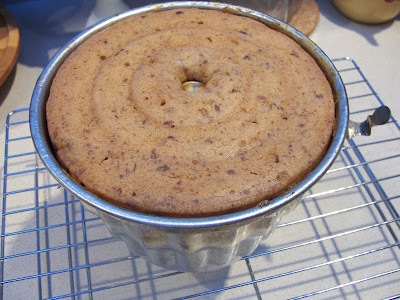 The steaming technique gently cooks the fat in the batter, and allows the pudding to slowly expand over several hours. Last year, we gave scrupulous attention to our Christmas Pudding project. We researched the history of this yuletide dessert, we investigated the benefits of ceramic and tin pudding molds, and we debated over just the right recipe. We checked in on each other’s progress by the hour, praised the virtues of hard sauce, and made a big fuss over the ceremonial flaming of the pudding. Jill was feeling under the weather last week, so she decided to go with last year’s recipe for the sake of expediency. I am a chronic experimenter, and wanted to try something new. Yet I am also starved for free time. I’m also not sure I want to go the beef suet route this year. Jill had used a recipe with butter which looked quite nice. 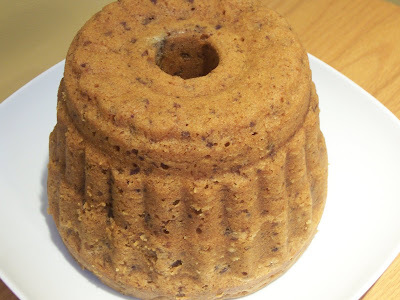 So I dip into the classic “The Frugal Gourmet Celebrates Christmas” where I find a festive recipe for Steamed Date Pudding with Whiskey Sauce. Once the ingredients are combined and steaming in the pot, it is a mere two hours to completion. That gives me plenty of time to catch up on back-logged episodes of the Bionic Woman. The Frugal Gourmet being, well, frugal, means that the recipe is a little low on alcohol. There is a whipped whiskey sauce that can accompany the dish, but I want my Christmas Pudding to be boozy, completely drenched in liquor. I locate a bottle of 80 proof Irish whiskey that has been aging (or perhaps neglected) in the cellar for nearly 20 years and go to work. I submerge the dates in whisky overnight, and I plan to soak the cheese cloth, that I will use to wrap the completed pudding before storing it for up to four weeks. With the really important ingredients accounted for, Sunday morning arrives and I realize that the recent Robert E. Lee Cake has completely depleted my cache of butter, so I must run out to the market at the last minute to pick up a fresh supply. So much for making that list and checking it twice. While at the grocery store, I suddenly experience a carnivorous craving and also purchase all the ingredients for a slow cooker dinner of polish sausage, apples and sauerkraut. At least I’m keeping consistent with the cooking techniques of the day, but clearly, the omission of beef suet from the pudding recipe has left me feeling deprived. I just use one of those space-age silicon spatulas. No sense of tradition, whatsoever. Back in the States, I am deep into preparation. In addition to dates, the recipe contains butter, honey, lemon zest and chopped pecans. I toast the pecans for a special touch. The batter mixes up quickly with my KitchenAid, which I’m certain Mrs. Crachit never had access to in Charles Dickens’ “A Christmas Carol.” I snap the lid of my tin mold shut, place it in the steamer, and position myself in front of the television for the next several hours. I don’t smell much in the way of spices, but the sauerkraut and beer is really tempting the old nostrils. About 120 minutes later, I return to the steamer and the results are heavenly. The lofty pudding is a golden-honey color and it slips easily out of the mold. It has the subtle aroma of warm spices, conjuring up mental images of gingerbread and visions of sugar plums. I wrap the finished pudding in gauzy cheese cloth, drenched in Irish whiskey, and tuck it into the back of the refrigerator for a long winter’s nap. T.W., I have never heard of Stir-Up Sunday, it's not something we celebrate here in Brazil. I would love to have a slice of your pudding, though - it looks so good! 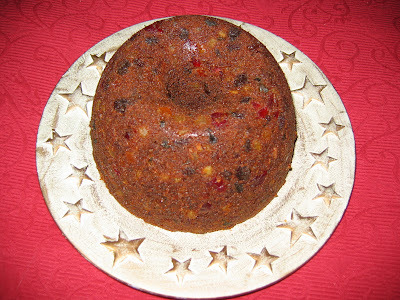 My English mother-in-law used to make Plum Pudding for Christmas. After reading your pudding posts, I wish I had asked her more about about it. Stir-Up Sunday would have been before we arrived for the holidays. Yours looks delicious--I like dates. 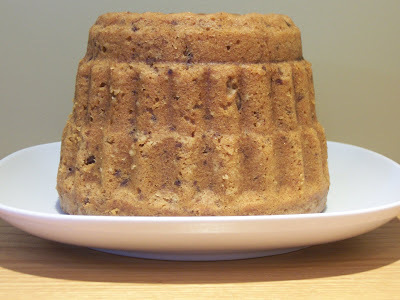 I have not made any steamed puddings before... but did go as far as to purchase the mold/pan. I have two, think they were on special or something. One of these days I will do it! you have inspired me , that's for sure. Could I plop a spoonful of cream on there>it looks perfect! Patricia - You should start the tradition of Stir-Up Sunday in Brazil! Kathy - It is interesting how little we often know about family recipes. I'm trying to ask more, and collect those recipes I remember when growing up. Lydia - Perhaps Ted could use a Bionic Woman to help clean up the kitchen! Jann - I did the same thing. 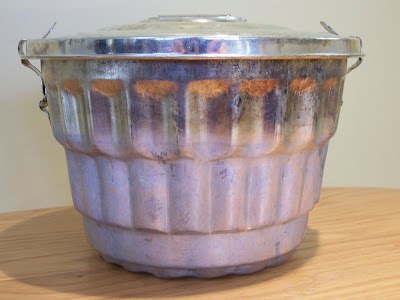 I had owned the mold for many years before I actually tried making a steamed pudding. Once I got started it was a lot easier than I thought, and the recipes that use butter are even faster and easier to prepare than those with suet. Hi Susan - Christmas Carols are always encouraged!!! That is one tasty looking pudding, T.W.! I do remember last year when You and Jill made the pudding together -virtually. Hi Veron - I can't wait to dig into it! But I have to give it four more weeks to "ripen!" I have that Frugal Gormet cookbook~ I always loved him on TV. He has probably retired to the frugal plains of Canada. I think it needed a little sumpin-sumpin too! Hi Sandi - The book has all kinds of great recipes from simple to elaborate. And by the way, I checked the pudding this morning, added a light shower of whiskey, and it seems to be "maturing" just fine!